According to a charter of 1023, Cnut gave to the monks of Canterbury the harbour of Sandwich, "with all the landings and dues on either side of the river from Pepperness to Marfleet... extending as far as a small axe can be thrown from a ship onto the land, when the ship is afloat and the river is in full flood." They also possessed "anything in the great sea beyond the harbour, as far as the sea at the utmost recedes, and the length of a man holding a pole in his hand, and stretching himself as far as he can reach into the sea." I do hope the monks of Sandwich went around throwing axes off ships and leaning over the sea with poles in their hands to test the exactitude of these measures. 7 gif aht is in ðare micelre sæ wiðutan ðare hæuene swa micel swa seo sæ heo mæst wiðteohð 7 git anes mannes længe þe healt ænne spreot on his hand 7 strecð hine swa feor swa he mæg aræcen into ðare sæ. I've been in East Anglia for a week; many (many) more pictures of churches to follow! These neither speak nor movement make. Where people dream, and loiter, and wander, and disquiet themselves in vain, to make a vain show; but do not profit because they prize not the blessings they have received. To prize what we have is a deep and heavenly instruction. It will make us righteous and serious, wise and holy, divine and blessed. Untouch'd and yet with child. 'Against her can be laid. Of Israel's flock so fair. As Scripture doth make plain. Of whom we were bereav'd. Did conquer death and hell. A carol collected in 1920 by Rev. G. H. Doble, from a woman named Elizabeth Hocking who lived in Redruth, Cornwall. Mrs Hocking, who was 84 at the time, had learnt this carol from her mother as a child in the 1840s. You can find the tune here; it's a nice one. 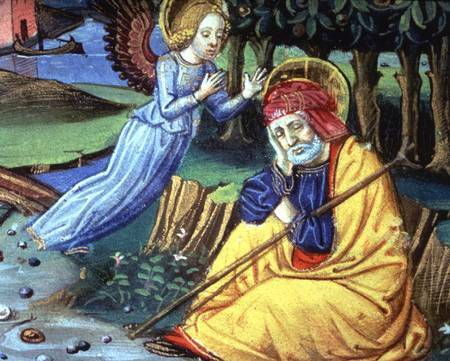 Happy St Joseph's Day! King Edward treated his brother [Æthelred], who was still a boy, and his stepmother with proper warmth of feeling, keeping the royal title for himself alone, but allowing them all other privileges. He followed in the footsteps of his father's religious activity; he listened to good advice and took it to heart. The woman however, with a stepmother's hatred and a viper's guile, in her anxiety that her son should also enjoy the title of king, laid plots against her stepson's life, which she carried out as follows. He was coming back tired from hunting, breathless and thirsty from his exertions; his companions were following the hounds where chance had led each one; and hearing that they were quartered in a neighbouring village, the young man spurred his horse and hastened to join them, all by himself, too innocent to have fears and no doubt judging other people by himself. On his arrival, his stepmother, with a woman's wiles, distracted his attention, and with a kiss of welcome offered him a drink. As he greedily drank it, she had him pierced with a dagger by one of her servants. Wounded mortally by the blow, he summoned up what breath he had left, and spurred his horse to join the rest of the party; but one foot slipped, and he was dragged through byways by the other, leaving streams of blood as a clear indication of his death to those who looked for him. At the time they ordered him to be buried without honour at Wareham, grudging him consecrated ground when he was dead, as they had grudged him the royal title while he was alive. So they enjoyed a public festival of rejoicing, as though they had buried his memory along with his corpse. But the divine Serenity acknowledged him, and did honour to the innocent victim with the glory of miracles: so far do Heaven's judgements outweigh those of men. There [at his grave] lights shone in the sky, there a lame man walked, there a dumb man regained the use of his tongue, there every kind of sickness gave way to health. The story spread through all England, and made the martyr's merits well known. 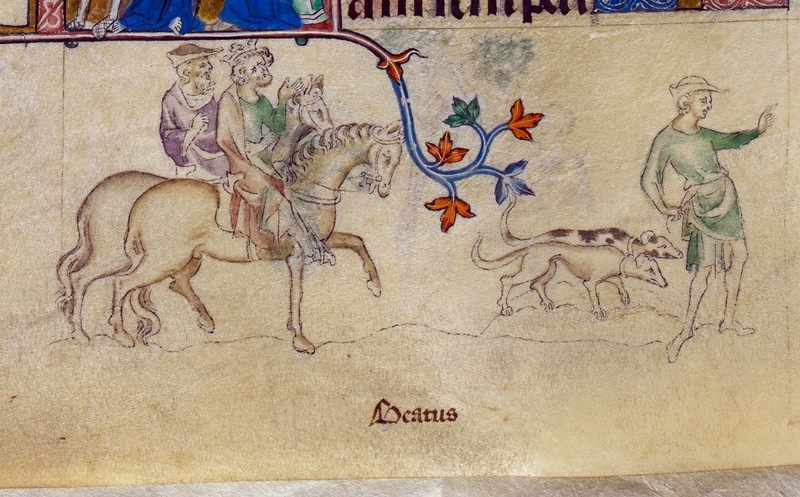 Aroused by this, the murderess planned a journey to the place; she had already mounted her horse and was spurring him on, when she felt the manifest anger of God. Her familiar palfrey on which she had been used to ride, and which had before been swift as air and could outstrip the very winds, then by the will of God stood motionless. The grooms set about it with whips and shouting, to make it carry its powerful mistress with its wonted eagerness; their labour was spent in vain. She changed her mount, but with the same result. At length, though slowly, her unfeeling heart understood the purport of the portent, and what she did not deserve to do herself she agreed to get done by another hand. 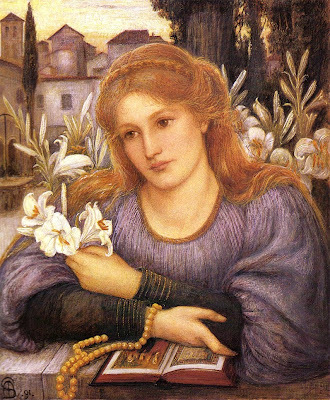 And since an unruly spirit is its own torment, and an anxious mind suffers its own evil genius even in this present world, Ælfthryth fell from her pride of royalty into a dire repentance, such that for many years at Wherwell she clad her delicately-nurtured limbs in haircloth and at night slept stretched on the ground without her pillow, besides inventing all the tortures she could for her body, a beautiful woman and finely faithful to her husband but worthy of punishment for the great crime she committed. It is believed, and is a widely popular view, that it was through her cruelty to Edward that the whole country, for a long time after, groaned under the barbarian yoke. Gesta Regum Anglorum, trans. R. A. B. Mynors, R. M. Thompson and M. Winterbottom (Oxford, 1998), vol.i, pp.265, 7. 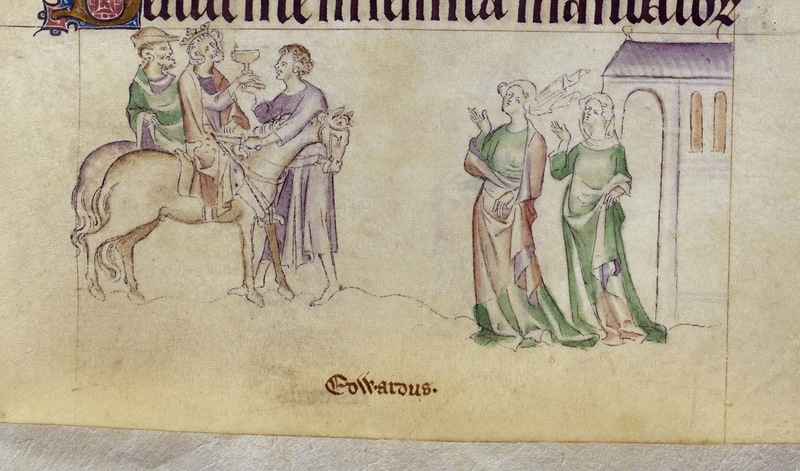 The murder of Edward cast a long shadow over Æthelred's reign. Although Æthelred was too young to have had any part in it himself, it was seen - in hindsight - as a bad omen, the first disaster of a long but troubled reign which was to be beset by factional fighting at court and the renewed pressure of Viking raids. It culminated in the Danes conquering England and driving Æthelred and his family into exile - the ultimate punishment for the murder of his brother, if you believe the medieval historians. St Dunstan, who was Archbishop of Canterbury at the time of Edward's death and Æthelred's accession, was later supposed to have prophesied to Æthelred that "because he had obtained the throne by his brother’s blood, he would live in blood, and his descendants would be destroyed by a cruel invasion of barbarians; and, moreover, the whole country would be depopulated for many centuries by the fierce dominion of these men". In recording this, Dunstan's hagiographer (in this case Eadmer), writing on the other side of the Norman Conquest, adds that "though Dunstan said these things would not happen while he was alive, nevertheless, he asserted in a very accurate prophecy that these things would eventually come to pass in every detail - just as we read in chronicles and see today". 'Today' is the early twelfth century; the suggestion is that St Edward's murder brought about not only the Danish Conquest of England, but the Norman Conquest too. As an antidote to that Harald Harefoot story. This omits Harold's brother Svein, because he never played any part in English history: he was sent to Norway with his mother in c.1030 and ruled there as Cnut's regent, with little success. After Cnut's death in 1035, both Harold and Harthacnut seem to have been considered viable candidates for the throne. The Anglo-Saxon Chronicle tells us that a council was held in Oxford to discuss the matter, at which Harold was supported by Mercia and the north of England, as well as by the Danish fleet (the liðsmen), who were based in London. 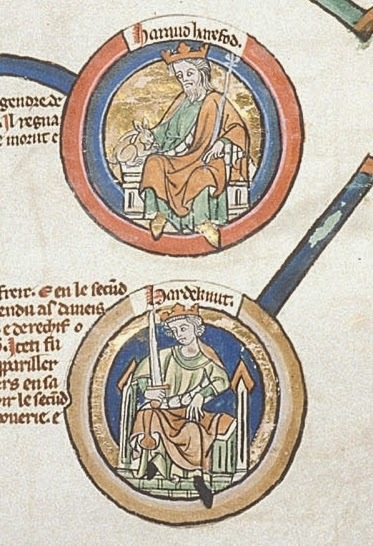 Wessex preferred his younger half-brother, but Harthacnut was away in Denmark at the time and thus missed his chance; before he could return to England, Wessex gave in and Harold became sole king. (Although the Archbishop of Canterbury supposedly refused to crown him.) Loyalty to the brothers split down traditional lines of allegiance in Anglo-Saxon England: Mercia and the north on one side, Wessex (by this period, the whole of England south of the Thames) on the other. Although there's a tendency to see Harold as the 'Danish' candidate, it's worth remembering that he was English on his mother's side, while Harthacnut was the son of a Danish father and a Norman mother, and both had spent more of their lives in Scandinavia than in England. Also, although Harold is sometimes called Cnut's 'illegitimate' son, pre-Conquest England (and Denmark) didn't have quite the same ideas of legitimacy as we do; Queen Emma certainly promoted the idea that her husband's other children should give place to her son Harthacnut, and Cnut may have agreed to this - but he made Svein regent of Norway, so only to a certain extent. Her swealt Harald cing. Þa sende man æfter Harðacnute to Bricge, wende þæt man wel dyde, 7 he com ða hider mid .lx. scipum foran to middan sumera, 7 astealde þa swiðe strang gyld þæt man hit uneaðe acom... 7 him wæs þa unhold eall þæt his ær gyrnde, 7 he ne gefremede ec naht cynelices þa hwile ðe he ricxode. He let dragan up þæne deadan Harald 7 hine on fen sceotan. John of Worcester adds more detail, saying that Harthacnut, with the assistance of Earl Godwine, Ælfric Archbishop of York, Styr the master of the king's household, Eadric his steward, Thrond his executioner and 'other men of great rank', had Harold's body exhumed and beheaded, and the body thrown into the Thames. A fisherman dragged it up again and gave it to 'the Danes', who buried it at their church in London (probably St Clement Danes). Poor Harold! If this story is true, it helps to explain why Harthacnut was so 'unkingly'. But Cnut's sons were not destined to rest in peace, it seems: Harthacnut himself was buried beside his father at Winchester, but in 1642, during the Civil War, his bones (together with those of Cnut himself, and Emma, William Rufus, and a number of other early kings) were dug up by Parliamentarian soldiers and scattered on the floor of the cathedral. Mixed up together, they were collected and preserved in six mortuary chests, where they now remain, unidentified - the greatest men and women of late Anglo-Saxon England, a jumble of bones. A kind of poetic justice for Harthacnut, at least, if he really did treat his half-brother's body with such disrespect. 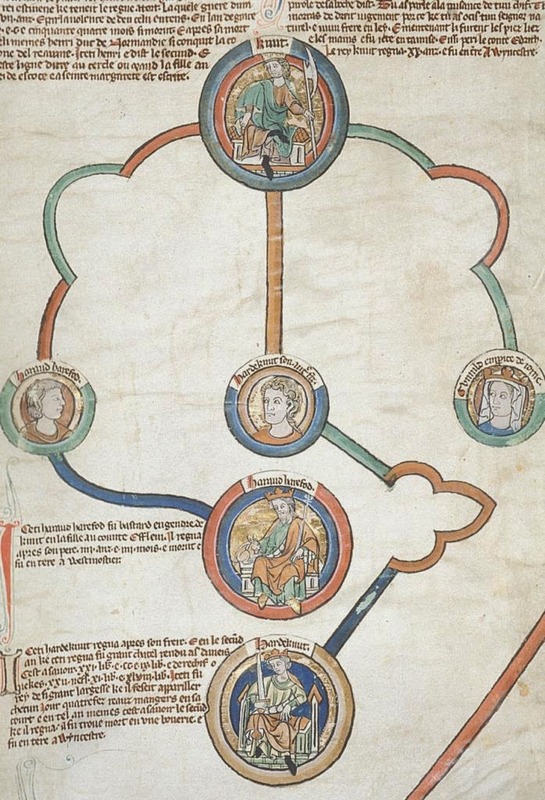 "There are reasons for believing that the Normans might have inspired the Anglo-Saxons to form nicknames of a more burlesque and abusive character than was earlier known." As the body is cladd in the cloth, and the flessch in the skynne, and the bonys in the flessch, and the harte in the bowke, so are we, soule and body, cladde and enclosydde in the goodnes of God. Yee, and more homely, for all they vanyssch and wast awey; the goodnesse of God is ever whole and more nere to us withoute any comparison. Julian of Norwich, Revelations of Divine Love, ch.6. "He it was who first wisely abolished that ancient or rather that corrupt custom of giving knives to every visitor on St Bartholomew’s day. By this both abbot and convent rejoice in being free for ever from heavy and needless expenses." St Bartholomew, who was one of Crowland's dedicatory saints, suffered martyrdom by being flayed alive, and so one of his attributes is a knife. I guess people were given them as souvenirs? Sounds like it would get pretty expensive - and a bit of a health and safety issue too. I found out today that the Crowland Chronicle, which I'm spending a lot of time on at the moment, was completed exactly 500 years, to the very day, before the day I was born. That's pretty cool. The girls were OK; their father ransomed them. Still: don't tell jokes about Viking kings.